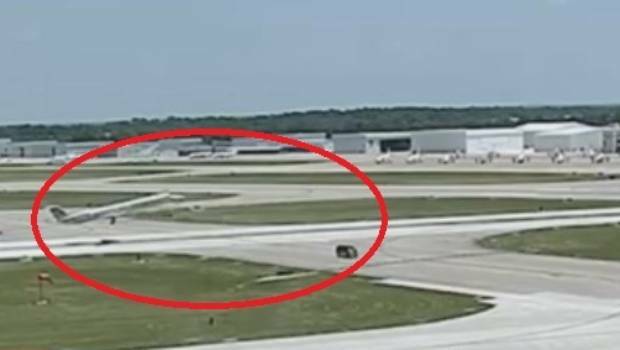 A video taken from the control tower shows a van crossing a runway at the Springfield-Branson National Airport in the US just seconds ahead of an airliner that was taking off. “I decided that due to the time limitations we would cross the runway in order to make it in time,” Brown wrote in his report. “It is generally my practice to look at both ends of any runway I cross, but I honestly cannot say for sure that I looked both ways or how far down the runway I might have looked,” Brown wrote. “About halfway across runway 14 the right front seat passenger said ‘Oh s…’. I looked out the right passenger window to see the landing lights of an E145 (passenger jet) coming down the runway. Brown, in his report, says he asked if any of his passengers heard that his van was cleared to cross runway 14 “and both stated that he did clear us to cross runway 14”. “The airport takes safety very seriously. As such, we are reviewing internal operating procedures that may have contributed to this incident.